Military-Affiliated Programs has raised $ 1,705 from 16 gifts! 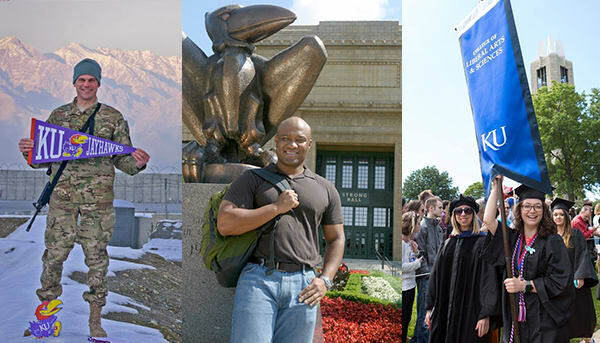 The University of Kansas is home to more than 1,300 current and former United States service members and their families who are now pursuing their dreams of higher education. Our goal is to make the KU programs and resources available to this cherished population of our student body, second to none. Whether you have served in the military, have a friend or family member who has served, or simply want to honor the sacrifice of our veterans, we hope you consider a gift to our programs. You will help us foster the legacy of selfless service we all hold close to our hearts. The Lt. Gen. William K. Jones Military- Affiliated Student Center at the University of Kansas is a centralized resource for current and former service members and their families pursuing higher education. Services focus on assisting with the transition to student life, successful degree completion and navigating Veterans Affairs benefits. Our objective is the successful transitioning of these military-affiliated students to their next chapter in life. This scholarship assists injured veterans and affected family members in meeting the financial challenges associated with pursuing a college degree. Veterans and their families who have been injured while in service to our country deserve the very best. The Office of Graduate Military Programs is honored to facilitate this program connecting grateful donors and our deserving students.